If you require additional grip in wet or dry conditions, the Vega Chemical-Resistant Latex Gauntlets are ideal for you. These gloves are designed with an embossed 'Powergrip' honeycomb coating, which improves your grip in wet or dry conditions. This particular coating also helps provide extra tactile sensitivity and dexterity. When these gloves were tested to EN 374-2, they received an AQL of 0.65, meaning they have obtained a level two in this area. Please see the chart below for the EN 374-3 results of the gauntlets. 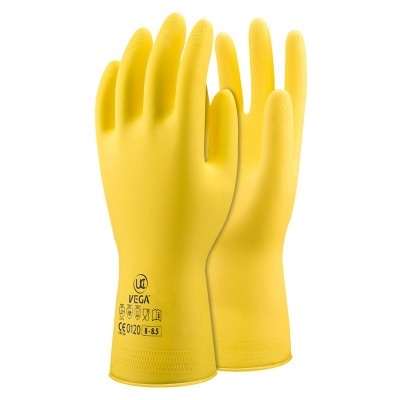 The Chemical-Resistant Gloves are designated Category III gloves. This means they're suitable for most high-risk tasks. As the gloves act as a protective barrier against your skin and chemicals or water, they're particularly suited to janitorial or agricultural work. The Chemical-Resistant Latex Gauntlets are available in four sizes to fit most hands. Please measure the circumference of your hand around the knuckles (excluding your thumb) with your palm open and your fingers together. The length of these gauntlet gloves is 30cm (12"). This extended cuff size makes them particularly useful if you work with chemicals or water. Please note that these gloves contain natural rubber latex. This material may produce an allergic reaction in some individuals.